For the domestic airport serving Osaka, see Itami Airport. 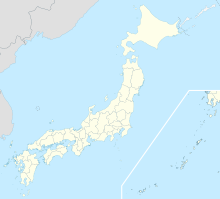 Kansai International Airport (関西国際空港, Kansai Kokusai Kūkō, colloquially known as Kankū (関空)) (IATA: KIX, ICAO: RJBB) is an international airport located on an artificial island in the middle of Osaka Bay off the Honshu shore, 38 km (24 mi) southwest of Ōsaka Station, located within three municipalities, including Izumisano (north), Sennan (south), and Tajiri (central), in Osaka Prefecture, Japan. Kansai opened on 4 September 1994 to relieve overcrowding at Osaka International Airport, which is closer to the city of Osaka and now handles only domestic flights. It consists of two terminals: Terminal 1 and Terminal 2. Terminal 1, designed by Italian architect Renzo Piano, is the longest airport terminal in the world with a length of 1.7 km (1.1 mi). The airport serves as an international hub for All Nippon Airways, Japan Airlines, and Nippon Cargo Airlines, and also serves as a hub for Peach, the first international low-cost carrier in Japan. In 2016, 25.2 million passengers used the airport making it the 30th busiest airport in Asia and 3rd busiest in Japan. Freight volume was at 802,162 tonnes total, of which 757,414 t were international (18th in the world), and 44,748 t were domestic. The 4,000 m × 60 m (13,123 ft × 197 ft) second runway was opened on 2 August 2007. As of June 2014[update], Kansai Airport has become an Asian hub, with 780 weekly flights to Asia and Australasia (including freight 119), 59 weekly flights to Europe and the Middle East (freight 5), and 80 weekly flights to North America (freight 42). An artificial island, 4 km (2.5 mi) long and 2.5 km (1.6 mi) wide, was proposed. Engineers needed to overcome the extremely high risks of earthquakes and typhoons (with storm surges of up to 3 m, 10 ft). The water depth is 18 m on top of 20 m of soft Holocene clay which holds 70% water. A million sand drains were built into the clay to remove water and solidify the clay. Construction started in 1987. The sea wall was finished in 1989 (made of rock and 48,000 tetrapods). Three mountains were excavated for 21 million m3 (27 million cu yd), and 180 million m3 (240 million cu yd) was used to construct island 1. 10,000 workers and 10 million work hours over three years, using eighty ships, were needed to complete the 30-metre (98 ft) (or 40 m) layer of earth over the sea floor and inside the sea wall. In 1990, a three kilometer bridge was completed to connect the island to the mainland at Rinku Town, at a cost of $1 billion. 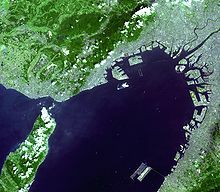 Completion of the artificial island increased the area of Osaka Prefecture just enough that it is no longer the smallest prefecture in Japan (Kagawa Prefecture is now the smallest). The bidding and construction of the airport was a source of international trade friction during the late 1980s and early 1990s. Prime Minister Yasuhiro Nakasone responded to American concerns, particularly from Senator Frank Murkowski, that bids would be rigged in Japanese companies' favour by providing special offices for prospective international contractors, which ultimately did little to ease the participation of foreign contractors in the bidding process. Later, foreign airlines complained that two-thirds of the departure hall counter space had been allocated to Japanese carriers, disproportionately to the actual carriage of passengers through the airport. As of 2008[update], the total cost of Kansai Airport was $20 billion including land reclamation, two runways, terminals and facilities. Most additional costs were initially due to the island sinking, expected due to the soft soils of Osaka Bay. After construction the rate of sinking was considered so severe that the airport was widely criticized as a geotechnical engineering disaster. The sink rate fell from 50 cm (20 in) per year during 1994 to 7 cm (2.8 in) per year in 2008. Opened on 4 September 1994, the airport serves as a hub for several airlines such as All Nippon Airways, Japan Airlines, and Nippon Cargo Airlines. It is the international gateway for Japan's Kansai region, which contains the major cities of Kyoto, Kobe, and Osaka. Other Kansai domestic flights fly from the older but more conveniently located Osaka International Airport in Itami, or from the newer Kobe Airport. The airport had been deeply in debt, losing $560 million in interest every year. Airlines had been kept away by high landing fees (about $7,500 for a Boeing 747), the second most expensive in the world after Narita's. In the early years of the airport's operation, excessive terminal rent and utility bills for on-site concessions also drove up operating costs: some estimates before opening held that a cup of coffee would have to cost US$10. Osaka business owners pressed the government to take a greater burden of the construction cost to keep the airport attractive to passengers and airlines. On 17 February 2005, Chubu Centrair International Airport opened in Nagoya, just east of Osaka. The opening of the airport was expected to increase competition between Japan's international airports. Despite this, passenger totals were up 11% in 2005 over 2004, and international passengers increased to 3.06 million in 2006, up 10% over 2005. Adding to the competition was the opening of Kobe Airport, less than 25 km (16 mi) away, in 2006 and the lengthening of the runway at Tokushima Airport in Shikoku in 2007. The main rationale behind the expansions was to compete with Incheon International Airport and Hong Kong International Airport as a gateway to Asia, as Tokyo area airports were severely congested. Kansai saw a 5% year-on-year increase in international traffic in summer 2013, largely supported by low-cost carrier traffic to Taiwan and Southeast Asia overcoming a decrease in traffic to China and South Korea. Kansai has been marketed as an alternative to Narita Airport for international travelers from the Greater Tokyo Area. By flying to Kansai from Haneda Airport and connecting to international flights there, travelers can save the additional time required to get to Narita: up to one and a half hours for many residents of Kanagawa Prefecture and southern Tokyo. The airport was at its limit during peak times, owing especially to freight flights, so a portion of Phase II expansion—the second runway—was made a priority. Thus, in 2003, believing that the sinking problem was almost over, the airport operators started to construct a 4,000 m (13,000 ft) second runway and terminal. The second runway opened on 2 August 2007, but with the originally planned terminal portion postponed. This lowered the project cost to JPY¥910 billion (approx. US$8 billion), saving ¥650 billion from the first estimate. The additional runway development, which was opened in time for the IAAF world athletics championships in Osaka, has expanded the airport size to 10.5 square kilometres (2,600 acres). The second runway is used for landings and when there are incidents prohibiting take off use of runway A. The new runway allowed the airport to start 24-hour operations in September 2007. A new terminal building opened in late 2012. There are additional plans for several new aprons, a third runway (06C/24C) with a length of 3,500 m (11,483 ft), a new cargo terminal and expanding the airport size to 13 km2 (5.0 sq mi). As of 2012[update], the Japanese government is postponing these plans for economic reasons. Since July 2008, Osaka Prefecture governor Toru Hashimoto has been a vocal critic of Itami Airport, arguing that the Chuo Shinkansen maglev line will make much of its domestic role irrelevant, and that its domestic functions should be transferred to Kansai Airport in conjunction with upgraded high-speed access to Kansai from central Osaka. In 2009, Hashimoto also publicly proposed moving the functions of Marine Corps Air Station Futenma to Kansai Airport as a possible solution for the political crisis surrounding the base. In May 2011, the Diet of Japan passed legislation to form a new Kansai International Airport Corporation using the state's existing equity stake in Kansai Airport and its property holdings at Itami Airport. The move was aimed at offsetting Kansai Airport's debt burden. The merger of the Itami and Kansai airport authorities was completed in July 2012. Shortly following the merger, Kansai Airport announced a 5% reduction in landing fees effective October 2012, with additional reductions during overnight hours when the airport is underutilized, and further discounts planned for the future, including subsidies for new airlines and routes. As of October 2012[update] these moves were intended to bring Kansai's fees closer to the level of Narita International Airport, where landing fees were around 20% lower than Kansai's, and to improve competitiveness with other Asian hubs such as Incheon International Airport in Korea. Since its formation, the new operating company has also made efforts toward international expansion, bidding for operating concessions at Yangon International Airport and Hanthawaddy International Airport in Myanmar. KIAC conducted a public tender to sell the operating rights for Kansai and Itami Airport in May 2015. Orix and Vinci SA were the sole bidder for the 45-year contract, at a price of around $18 billion. The new operating company, Kansai Airports, took over on April 1, 2016. It is 80% owned by Orix and Vinci, with the remaining 20% owned by Kansai-based enterprises such as Hankyu Hanshin Holdings and Panasonic. On 4 September 2018, the airport was hit by Typhoon Jebi. The airport ceased operations after the typhoon inundated the island under meters of seawater. The situation was further exacerbated when a large tanker crashed into the bridge that links the airport to the mainland, effectively stranding the people remaining at the airport. All flights at the airport were cancelled until 6 September, at which date Prime Minister Shinzō Abe announced the airport would partially resume domestic operations. The main KIX passenger terminal, Terminal 1, is a single four-storey building designed by Renzo Piano Building Workshop (Renzo Piano and Noriaki Okabe), and has a gross floor space of 296,043 square metres (3,186,580 sq ft). As of 2018[update], at a total length of 1.7 km (1.1 mi) from end to end, Terminal 1 is the longest airport terminal in the world. It has a sophisticated people mover system called the Wing Shuttle, which moves passengers from one end of the pier to the other. The terminal's roof is shaped like an airfoil. This shape is used to promote air circulation through the building: giant air conditioning ducts blow air upwards at one side of the terminal, circulate the air across the curvature of the ceiling, and collect the air through intakes at the other side. Mobiles are suspended in the ticketing hall to take advantage of the flowing air. The ticketing hall overlooks the international departures concourse, and the two are separated by a glass partition. During Kansai's early days, visitors were known to throw objects over the partition to friends in the corridor below. The partition was eventually modified to halt this practice. Terminal 2 is a low-cost carrier (LCC) terminal designed to attract more LCCs by providing lower landing fees than Terminal 1. It is exclusively occupied by Peach, Spring Airlines and Jeju Air. Other LCCs serving Kansai, such as Jetstar Airways, Jetstar Japan, and Cebu Pacific Air, use the main Terminal 1. Peach requested that Terminal 2 have a simplified design in order to minimize operating costs. The terminal is a single-story building, thus eliminating the cost of elevators. Passageways to aircraft have no air conditioning. The terminal also has no jet bridges, having one boarding gate for domestic departures and one boarding gate for international departures. In case of rain, passengers are lent umbrellas to use as they walk to the aircraft. Terminal 2 is not directly connected to Terminal 1 or to Kansai Airport Station. Free shuttle buses run between the two terminals, and between Terminal 2 and the railway and ferry stations. It is also possible to walk between the terminals through the KIX Sora Park, a four-hectare park located adjacent to Terminal 2. Kansai International Airport is connected only by the Sky Gate Bridge R, a road/railroad bridge to Rinku Town and the mainland. The lower railroad level of the bridge is used by two railroad operators: JR West and Nankai Electric Railway. JR West operates the Haruka limited express train services for Kansai Airport Station from Tennōji, Shin-Ōsaka, and Kyoto Station. JR West also offers "Kansai Airport Rapid" services for Kansai Airport Station from Ōsaka, Kyōbashi Station, and several stations on the way. Various connections, such as buses, subways, trams, and other railroads, are available at each station. Nankai operates the rapi:t, a limited express train service to Namba Station on the southern edge of downtown Osaka. Osaka Metro connections are available at Namba and Tengachaya Station. Kansai Airport Transportation Enterprise and other bus operators offer scheduled express bus services, called "Airport Limousines", for Kansai International Airport. Two six story parking structures, called P1 and P2, are located above a railroad terminal station, while the other two level parking facilities, called P3 and P4, are situated next to "Aeroplaza", a hotel complex. The airport is only accessible from the Sky Gate Bridge R, a part of Kansai Airport Expressway. The expressway immediately connects to Hanshin Expressways Route 5, "Wangan Route", and Hanwa Expressway. Because of the damage sustained during Typhoon Jebi in September 2018, in which two road spans on the southern (airport-bound) side were dislodged and partially crushed by a tanker that had come unmoored in the storm, both lanes of traffic have been rerouted onto the northern (shore-bound) side, and customers are urged to use public transit whenever possible, especially during peak hours. In July 2007, high-speed ferry service began. OM Kobe operates "Bay Shuttle" between Kobe Airport and KIX. The journey takes about thirty minutes. Kensetsu-to, the headquarters of Peach Aviation and the Kansai International Airport Land Development Co., Ltd. The head office of the Kansai International Airport Land Development Co., Ltd. (KALD, 関西国際空港用地造成株式会社 Kansai Kokusai Kūkō Yōchi Zōsei Kabushiki Kaisha) is on the fourth floor. The Peach Aviation head office is on the fifth floor. Airport access bridge ("The Sky Gate Bridge R"), which as of 2011 is the longest truss bridge in the world at 3,750 m (12,303 ft). The double-decker bridge consists of a lower deck devoted to rail, with the upper for road. ^ "New Management Setup of Kansai Airport" (PDF). Kansai Airports. Kansai Airports. 1 April 2016. Retrieved 24 April 2016. ^ "FedEx Opens North Pacific Regional Hub at Kansai International Airport". newswit.com. 3 July 2014. Retrieved 3 July 2014. ^ "AIS Japan". 22 July 2011. Archived from the original on 22 July 2011. Retrieved 15 July 2018. ^ a b Home Archived 8 August 2011 at the Wayback Machine. Hotel Nikko Kansai Airport. Retrieved on 23 July 2011. "Hotel Nikko Kansai Airport 1, Senshu-kuko Kita, Izumisano-shi, Osaka, 549-0001, Japan "
^ a b "OSAKA KANSAI (Kansai International Airport)." JAL Cargo. Retrieved on 23 July 2011. "Departure JAL Export Cargo Bldg. 1 Senshu Airport Minami, Sennan, Osaka Arrival JALKAS Import Cargo Bldg. 1 Senshu Airport Minami, Sennan, Osaka"
^ "航空運送事業の許可について（Peach・Aviation 株式会社）." Ministry of Land, Infrastructure, Transport, and Tourism. 7 July 2011 (Heisei 23). Retrieved on 21 July 2011. "１．本社所在地 大阪府泉南郡田尻町泉州空港中１番地（関西空港内）"
^ Kansai International Airport Statistics Archived 29 May 2012 at the Wayback Machine – Kansai International Airport Co., Ltd.
^ Kansai International Airport 2014 summer Flight Schedules – Kansai International Airport Co., Ltd.
^ Osaka Journal; Impatient City's Mission: Steal Tokyo's Thunder, New York Times, 9 December 1989. ^ Rice, Peter (4 September 1994). "Kansai International Airport terminal building". Engineering Timelines / Arup Group. Retrieved 24 March 2017. ^ a b c Mesri, Gholamreza (February 2015). 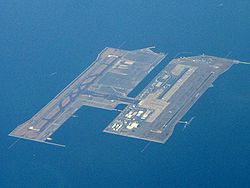 "Settlement of the Kansai International Airport Islands". Journal of Geotechnical and Geoenvironmental Engineering. ASCE Library. 141 (2). doi:10.1061/(asce)gt.1943-5606.0001224. Retrieved 24 March 2017. ^ a b "Kansai International Airport Land Co., Ltd - Technical Information - Land Settlement - Why Settlement Occurs". Kansai. Retrieved 24 March 2017. ^ a b "Kansai International Airport Land Co., Ltd - Technical Information - Approach to Settlement - Condition of the Settlement". Kansai. Retrieved 24 March 2017. ^ Some Minor Gains on Trade Conflicts, New York Times, 2 May 1987. ^ US Cancels A Plan To Begin Sanctions After Japan Acts, New York Times, 27 October 1993. ^ Osaka Notebook, International Herald Tribune, 24 August 1992. ^ Sinking Feeling at Hong Kong Airport, International Herald Tribune, 22 January 1982. ^ Osaka Journal; Huge Airport Has Its Wings Clipped, New York Times, 3 July 1991. ^ "Kansai International Airport Land Co., Ltd - Technical Information - Approach to Settlement - Condition of the Settlement". Retrieved 4 June 2015. ^ Will Fees Sink New Osaka Airport?, International Herald Tribune, 5 August 1994. ^ Pride and (Ouch!) Price: The $14 Billion Airport, New York Times, 16 December 1993. ^ "関空、夏季の国際線旅客５％増　台湾・東南ア顧客が増加見通し". 日本経済新聞. 19 July 2013. Retrieved 19 July 2013. ^ "関空支援を国に要望　促進協、ターミナル整備など". 日本経済新聞. 22 August 2013. Retrieved 22 August 2013. ^ The reason for construction of The 2nd runway Archived 22 July 2007 at the Wayback Machine– Kansai International Airport Co., Ltd.
^ "24 hours operation from 1st September 2007" from Sankei Newspaper (Japanese) on 24 August 2007. ^ KIX Terminal2 Archived 16 January 2013 at the Wayback Machine. Kansai-airport.or.jp (28 October 2012). Retrieved on 16 August 2013. ^ "New Management Set-up of Kansai Airports" (PDF). Retrieved 15 July 2018. ^ 伊藤, 正泰 (11 September 2015). "新関空会社とオリックス陣営、空港運営権の売却で大筋合意". The Nikkei. Retrieved 14 September 2015. ^ The Mainichi (4 September 2018). "Ship smashes into Kansai airport bridge as typhoon hits Japan". Archived from the original on 4 September 2018. Retrieved 4 September 2018. ^ NHK World News (6 September 2018). "Abe: Kansai airport to partially reopen on Friday". Archived from the original on 6 September 2018. Retrieved 6 September 2018. ^ "Osaka Kansai International Airport". Skyscanner. 31 May 2018. Archived from the original on 11 October 2018. Retrieved 11 October 2018. ^ Commercial offer to the fore as Kansai opens budget terminal. TheMoodieReport.com. Retrieved on 16 August 2013. ^ Kansai Airport opens new terminal for low-cost carriers – AJW by The Asahi Shimbun Archived 1 November 2012 at the Wayback Machine. Ajw.asahi.com. Retrieved on 16 August 2013. ^ (in Japanese) ：日本経済新聞. Nikkei.com. Retrieved on 16 August 2013. ^ Large "Ecopark" Outside Kansai Terminal 2 with Fields, "Ecofarm" and More – Airport News Japan. En.airportnews.jp (25 October 2012). Retrieved on 16 August 2013. ^ "Air Busan expands Daegu - Japan service from Dec 2016". routesonline. Retrieved 22 November 2016. ^ "Air Canada S19 Osaka service adjustment". Routesonline. 18 June 2018. Retrieved 18 June 2018. ^ Oct 14 (14 October 2018). "Airlineroute on Twitter: "Air Canada's seasonal Vancouver – Osaka Kansai service will be delayed to 01JUN19 in 2019, instead of from 12MAY19"". Twitter.com. Retrieved 30 October 2018. ^ "Air China adds Tianjin to Osaka service". Routesonline. Retrieved 30 January 2019. ^ "Air Seoul files preliminary Osaka schedule from Sep 2017". Routesonline. Retrieved 12 June 2017. ^ "AirAsia X proposes Honolulu launch in June 2017". routesonline. Retrieved 6 February 2017. ^ "British Airways to resume KIX-London flights for first time in 20 years - Nonstop service on the route for first time in 10 years -" (PDF). Kansai Airport. Retrieved 25 September 2018. ^ Eastern "China Eastern revises Dalian – Osaka service in W17" Check |url= value (help). routesonline. Retrieved 30 October 2017. ^ "China Eastern Adds Yanji – Osaka Service from July 2015 :: Routesonline". Airlineroute.net. Retrieved 15 July 2018. ^ "Delta resumes Seattle – Osaka service from April 2019". routesonline. Retrieved 9 July 2018. ^ "Delta Air Lines - Tony's Regional Update - SEA - Winter 2019 – Page 5". Delta Up & Away. Retrieved 9 February 2019. ^ "Egypt Air adds charter flights to Japan in W16". Routesonline. Retrieved 15 July 2018. ^ a b "Jeju Air adds Osaka – Guam service from late-July 2018". Routesonline. Retrieved 15 July 2018. ^ "Jeju Air schedules international service from Muan in 2Q18". Routesonline. Retrieved 15 July 2018. ^ "Jetstar Asia launches first direct service to Osaka from Clark". Jetstar.com. Retrieved 26 January 2018. ^ "Jetstar Japan to launch Tokyo Narita/Osaka Kansai-Kochi services". CAPA. Retrieved 14 September 2018. ^ "Jetstar Japan to launch new daily service from KIX to Kumamoto" (PDF). Kansai Airport. Retrieved 19 July 2018. ^ "Jetstar Japan adds Osaka – Shimojishima service from July 2019". routesonline. Retrieved 17 March 2019. ^ "Jetstar Pacific plans Sep 2017 Osaka debut". Routesonline. Retrieved 12 June 2017. ^ "Jin Air Adds New Routes from Busan eff late-Sept 2015". Airlineroute.net. 24 August 2015. Retrieved 24 August 2015. ^ "Juneyao Airlines Adds Nanjing – Osaka Route from Aug 2016". routesonline. Retrieved 17 June 2016. ^ "Juneyao Airlines adds Qingdao – Osaka service from late-March 2019". routesonline. Retrieved 26 February 2019. ^ "Lufthansa S19 long-haul changes as of 10OCT18". Routesonline. Retrieved 30 October 2018. ^ "NokScoot adds Osaka service in late-Oct 2018". routesonline. Retrieved 23 August 2018. 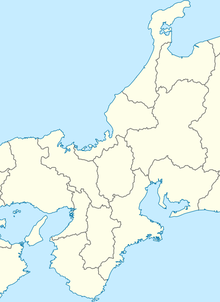 ^ "Peach begin service to Kushiro from 2018". Routesonline.com. Retrieved 15 July 2018. ^ "Peach adds Osaka – Niigata service in March 2018". Routesonline. Retrieved 15 July 2018. ^ "Philippine Airlines Files Preliminary Taipei – Osaka Schedule from late-June 2016". airlineroute. Retrieved 22 February 2016. ^ "Qantas to launch seasonal Sydney-Osaka flights". Australian Business Traveller. Retrieved 27 July 2017. ^ "Qantas converts Sydney – Osaka to year-round service in 2018". routesonline. Retrieved 14 September 2017. ^ "Scoot moves forward Honolulu service cancellation to early-May 2019". AirlineRoute. 20 March 2019. Retrieved 20 March 2019. ^ "Shandong Airlines Adds New Osaka Service from July 2015". Airlineroute.net. 4 June 2015. Retrieved 4 June 2015. ^ "Shenzhen Airlines to Start Beijing - Osaka Flight from July 2015". Airlineroute.net. 29 April 2015. Retrieved 29 April 2015. ^ "Shenzhen Airlines Expands Osaka Service in W15". Airlineroute.net. 10 November 2015. Retrieved 10 November 2015. ^ "Sichuan Airlines adds Xi'An – Osaka from late-Nov 2018". Routesonline. Retrieved 30 October 2018. ^ "Spring Airlines adds Guangzhou – Osaka service from Feb 2019". routesonline. Retrieved 10 January 2019. ^ "Spring Airlines Launches 4 New China – Osaka Routes in S15". Retrieved 4 June 2015. 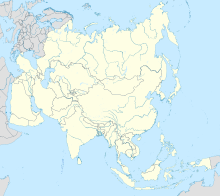 ^ "Thai Lion Air schedules additional routes to Japan in 1Q19". routesonline. Retrieved 27 January 2018. ^ "tigerair Taiwan Adds Kaohsiung - Osaka; Bangkok Service Reductions from July 2015". Airlineroute.net. 16 June 2015. Retrieved 16 June 2015. ^ a b "T'Way Air boosts Osaka flights in S17". routesonline. Retrieved 8 May 2017. ^ "Tway". Twayair.com. Archived from the original on 8 September 2015. Retrieved 15 July 2018. ^ "Vanilla Air adds Osaka – Amami Oshima service in S17". routesonline. Retrieved 10 January 2017. ^ "Vietjet Air adds Ho Chi Minh City – Osaka route from Dec 2018". routesonline. Retrieved 25 July 2018. ^ "Vietnam Airlines to offer new route between KIX and Da Nang" (PDF). Kansai Airport. Retrieved 30 August 2018. ^ "Xiamen Airlines plans Hangzhou – Osaka launch in late-Oct 2018". routesonline. Retrieved 25 September 2018. ^ "Kansai Airport limousine". Retrieved 4 June 2015. ^ "090406a.pdf Archived 25 April 2012 at the Wayback Machine." Kansai International Airport Land Development Co., Ltd. Retrieved on 2 November 2011. "Kansai Airport Agency Company Building (4F) 1 Senshu-Kuko Kita, Izumisano, Osaka 549-0001"
^ "会社情報 Archived 17 November 2011 at the Wayback Machine." Kansai Airport Agency. Retrieved on 2 November 2011. "〒５４９－０００１ 大阪府泉佐野市泉州空港北１番地航空会社北ビル４Ｆ"
^ "見学ホール Archived 25 April 2012 at the Wayback Machine." Kansai International Airport Land Development Co., Ltd. Retrieved on 1 November 2011. "〒549–0001　大阪府泉佐野市泉州空港北一番地　建設棟4F"
^ "About Us." Peach. Retrieved on 1 November 2011. "Izumisano-shi, Osaka, Japan 549-8585" Address in Japanese: "大阪府泉佐野市"
^ "Airport Facilities Information Archived 5 June 2011 at the Wayback Machine." Kansai International Airport. Retrieved on 23 July 2011. "" ^ "About Us." Peach. Retrieved on 21 July 2011. "Tajiri-cho, Sennangun, Osaka, Japan" Address in Japanese: "本社所在地 大阪府泉南郡田尻町"
Hausler, E. and N. Sitar. "Performance of Soil Improvement Techniques in Earthquakes." (Archive) (Report in Progress) Pacific Earthquake Engineering Research Center, University of California Berkeley. Wikimedia Commons has media related to Kansai International Airport. Wikivoyage has a travel guide for Kansai International Airport.